We enjoyed Rick Stein’s “From Venice to Istanbul” tv programme last year and we tried his Lamb Kleftiko. A couple of very good pairings with that dish can be found here. 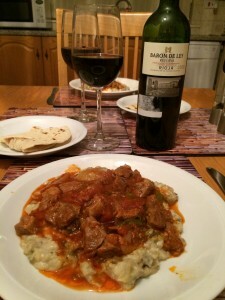 This time we cooked his rich Turkish lamb stew with aubergine purée (Hunkar begendi). Boned lamb shoulder is cooked with red pepper paste, tomato paste, onion, garlic, green chilli, green pepper, tomatoes, oregano and seasoning. The lamb stew is served on a bed of aubergine purée made from mashed aubergine, milk, flour, Parmesan, lemon juice and seasoning. We served with flatbread. We opened a bottle of Baron de Ley Rioja Reserva from the Co-op. A previous bottle of this medium-bodied Spanish red was very good with lamb chops. There were black fruits on the nose, a vanilla sweetness with mocha and sweet black fruits on the palate. A good match with the meal, but we thought the flavours in the aubergine purée may have detracted a little from the pairing. We finished off the leftovers with a bottle of Dark Corner Durif Shiraz 2014, a full-bodied Australian red from the Sunday Times Wine Club. We chose this wine because it had previously made a very good match with lamb meatballs in tomato sauce. There were brambly fruits on the nose, vanilla sweetness on the palate, with blackberry fruit and a milk chocolate and coffee mocha finish. The Shiraz was a better match than the Rioja with this particular combination of Turkish lamb stew and aubergine purée. For a midweek meal we tried the Lamb Chop Bake recipe from the All Recipes UK website. Lamb chops are sprinkled with rosemary and seasonings and baked with potato wedges, carrots and courgettes. We added some aubergines too. A stock made from a lamb stock cube and tomato purée is poured over. A yummy recipe. 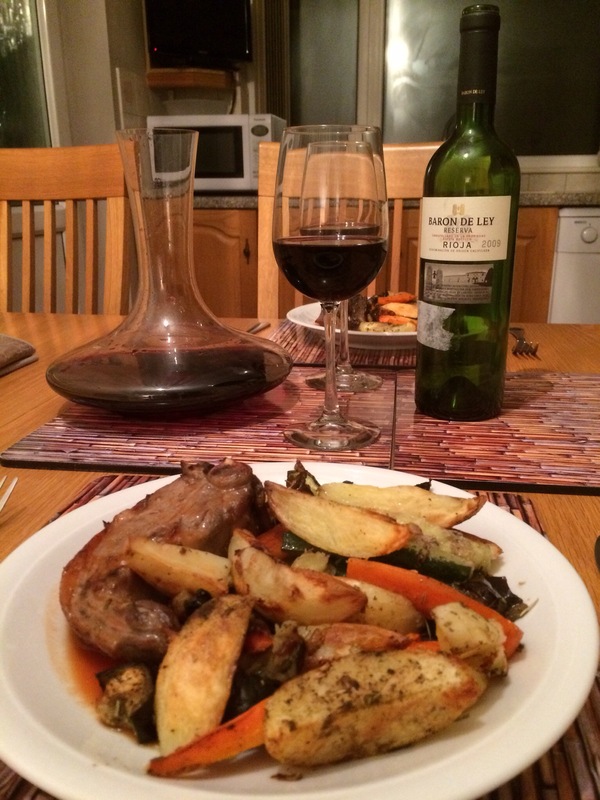 Riojas are usually reliably good with lamb chops. (See here for a great pairing). We opened a bottle of Baron de Ley Rioja Reserva 2009, a medium-bodied Spanish red from the Co-op. We detected black fruits on the nose, followed by vanilla oak sweetness on the palate, with creamy black cherries and tobacco hints on the finish. The wine was a very good match with the baked lamb chops.